DS2482 1-wire bus master driver implemented in ./drivers/w1/masters/ds2482.c has incomplete support for strong pull-up feature. Driver sets chip registers properly, however it completely ignores requested delay value (in milliseconds). As a result, write-read operation happens too fast, and parasitically-powered 1-wire slave devices have not enough time to charge and perform requested operation. In comparison, GPIO-based w1 master driver adds such delay via msleep(..) method call. Proposed patch fixes the issue by introducing delay between write and read operations. Implementation is similar to GPIO-based w1 master driver. Exact delay duration in milliseconds is received from w1-slave driver. * would be issued right before the subsequent read request. * would charge and do the conversion properly. Changes are made in accordance with DS2482 chip specification. Tested with DS18B20 temperature sensor (w1_therm driver) and latest truck version. Tested using externally powered and parasitically-powered sensor configuration. 891-drivers_w1_masters_ds2482_pullup_delay.patch​ (1.9 KB) - added by Eugene Yarshevich <yarshevich@…> 22 months ago. 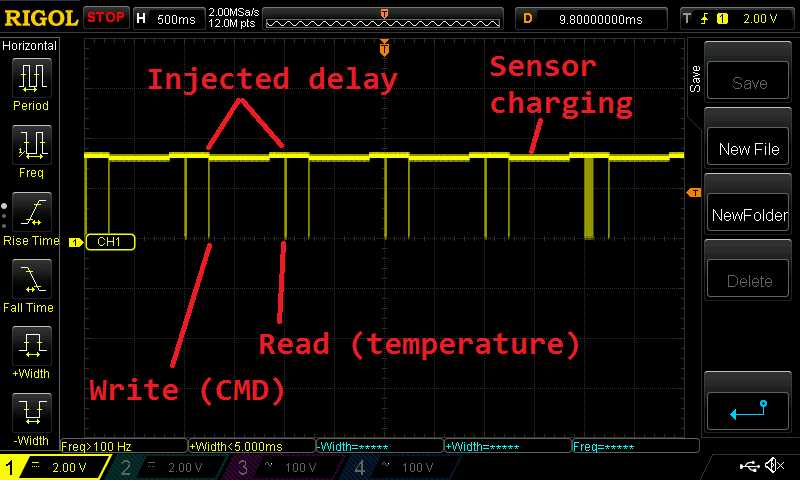 ds2482-1wire-master-pullup-delay.png​ (38.2 KB) - added by Eugene Yarshevich <yarshevich@…> 22 months ago.